Ethics are the guiding principles of an empire and its people. Ethics determine an empire's favored courses of action and responses to situations. Ethics have a profound effect on options available during the game. For instance, diplomatic options with alien species are affected by ethics, as are some options for dealing with anomalies. As a result, ethics choices have a greater impact on game experience than the bonuses and maluses listed on this page. Empires and individual populations don't always align ethically which can cause internal strife in large nations. AI species follow the same ethics rules and their behavior is heavily dependent on the ethics they follow. Naturally, a Militarist Xenophobe alien empire will react very differently to the player than a Pacifist Xenophile. AI empires will, however, compromise on their ethics if circumstances are dire enough, for instance, if threatened with imminent conquest. Every empire except Fallen Empires can have either three moderate ethics or one fanatic and one moderate ethic. Fallen Empires have only one fanatic ethic. Pops have only one moderate ethic each. Each pop in an empire will now only embrace a single, moderate ethic. At the start of the game, the population will have only the ethics that you picked in species setup but as the empire grows, its population will become more diverse in its views and wants. Each ethic has an attraction value for each pop in an empire depending on both the empire's situation and their own situation. For example, enslaved pops tend to become more egalitarian, while pops living around non-enslaved aliens become more xenophilic and pops living around enslaved aliens more xenophobic. Conversely, fighting a lot of wars will increase the attraction for militarism across your entire empire, while an alien empire purging pops of a particular species will massively increase the attraction for xenophobic for the species being purged. Over time, the ethics of the pops will drift in such a way that it roughly matches the overall attraction of that value. For example, if the materialist attraction sits at 10% for decades, it's likely that after that time, around 10% of all pops will be materialist. There is some random factor so it's likely never going to match up perfectly, but the system is built to try and go towards the mean, so the more over-represented an ethic is compared to its attraction, the more likely pops are to drift away from it and vice versa. Every empire is limited in the number of ethics it can possess. In general, it's possible to either have three different moderate ethics or one fanatical ethic and one moderate one. By default, each ethic is neutral which provides no bonuses nor maluses. Each "step" into a given ethic costs one point and will lock/unlock different government types and Civics as well as specific bonuses and possibly maluses. Investing two points into one type results in a more "extreme" version of an ethic that further warps your government's political persona in that specific direction, for better or worse. In addition, ethics exist and are propagated at the population level, with each individual pop unit in your empire having the capability to have, develop, and deviate from your starting ethics. The numerical modifiers affecting the probabilities and likelihoods of this happening are detailed in the specific pop ethic weights tables for each dichotomous relation. The authoritarian - egalitarian dichotomy axis looks at how the political power is distributed within the empire, be it in the hands of many, few or one individual. Authoritarians believe that power should be concentrated in the hands of a few individuals whose rule should be entrenched by a strong social hierarchy and limited political freedoms. Authoritarianism is not diametrically opposed to democracy, as both forms of government tend to have some form of submission to authority. The difference occurs in that egalitarians prefer to divide responsibility for decision making among as many individuals as possible, where authoritarians prefer to concentrate such responsibilities into the hands of a select few individuals or a single ruler. The political belief in who should hold power naturally has societal implications: authoritarians, believing power should be concentrated into the hands of a few, would seek to install strong social hierarchies and limit the social mobility of individuals to preserve that structure. Social stratification, on the other hand, would be a concept abhorrent to egalitarians - in fact, such a concept is perhaps the antithesis of egalitarianism, which seeks to eliminate such hierarchies. Following these beliefs, authoritarians cannot have Democratic authority, while egalitarians cannot have Autocratic authority. Fanatic authoritarians and egalitarians go further and require autocratic and respectively Democratic authority. Authoritarians also have the ability to displace pops, where instead of being purged, pops are deported and forced to flee, either to other empires or perhaps to unclaimed planets. Ingame, authoritarians have access to stratified economies, meant to imitate the rigid social hierarchies that typify authoritarian societies. Egalitarians, on the other hand, believing in equality, have access to the "Utopian Abundance" living standard, increasing happiness at the expense of increase consumer goods use. A single voice, a single throne, a single state. It is the solemn duty of the masses to obey those enlightened few who have been charged with the great responsibility of leadership. Any society that does not embrace equality between its members - where an individual can rise to any position with enough hard work - is not only deeply unfair, but ultimately counterproductive. Beware always those who would be despots, under the false presumption that their desires and agendas are somehow more imperative than those of their fellows. A society that does not see to the needs and rights of all of its members is not a society - it is a crime. 1.50 A pop of this species is enslaved. Ignores robot Pops. 1.25 A pop from another species is enslaved. Unless a pop of this species is also enslaved. Ignores robot Pops. 1.50 Is not enslaved but another non-Robot pop on the world is. The xenophobe - xenophile dichotomy axis looks at the empire's views regarding foreign species. Xenophobes consider that different species would introduce foreign ideas and thoughts that could destabilize and, in the end, destroy the empire or, at the very least, its cultural and genetic identity. In contrast, Xenophiles believe that society would grow stagnant without different concepts and moralities and are thus considered staunch believers in unity by diversity. Xenophobes are particularly keen on enslaving and displacing aliens and will never accept them as equals while Xenophiles prefer making alliances, viewing all organics as equal. There exists, in all of us, a deep-seated fascination for the unknown. An adventurous spirit that rejects the familiar and glories in the unfamiliar, whatever - or whomever - it may be. If there ever was such a thing as an absolute moral imperative, it would be to explore the cosmos and embrace all within it. We were never meant to journey alone. The militarist - pacifist dichotomy axis considers the merit of war. Militarists view aggression as the only needed form of diplomacy, upholding warfare as a tradition. In contrast, pacifists believe that violence breeds self-defeating hatred and that friendly cooperation between empires is more beneficial than undignified bloodshed. Militarists gain valuable advantages in warfare. Pacifists are able to focus more on events closer to home, with increased stability and administrative caps. The only true virtues are courage and discipline, and channeled properly they can overcome any obstacle. Therein lies true strength; force withheld, a promise made. Conflict as a means to an end is a ridiculous concept. It is by nature destructive, destroying what was to be obtained or giving room to grow that which was to be destroyed. As civilized beings, the end of all armed conflict should be our primary concern. War is an evolutionary dead end, as futile as it is wasteful. The materialist - spiritualist dichotomy axis looks at Epistemology, Metaphysics, the nature of being and reality in general as well as the empire's view on the Mind-Body Problem. On one hand, materialists disregard religion as superstition, considering that life has no intrinsic meaning outside of their own reality and that the only true purpose is what they make of it. In contrast, spiritualists, reject raw, 'hard' science and believe that consciousness surpasses materiality and that their temporal, corporeal bodies, subjected to the vicissitudes of the universe, are only a means towards a greater end: To improve themselves spiritually in anticipation of their future ascension to higher planes of existence. Materialists are scientific and get a bonus to research speed and robot upkeep, while Spiritualists strive towards piety and tradition and thus gain more unity and have lower edict costs. Materialists are more likely to draw Robotic technologies, while Spiritualists are more likely to draw Psionic technologies. Materialists are normally unable to access psionics research unless they have employed a scientist with the leader trait Expertise: Psionics. The trait is only available through an event because it's inaccessible without the technology Psionic Theory, which is also inaccessible without the expertise trait. Even having a maniacal Society leader is not sufficient for a Materialist empire. Spiritualists on the other hand are capable of accessing robotics research without any restrictions but will suffer happiness penalties for not outlawing AI and cannot give citizen rights to robots of any kind. Although it hurts, we must grow up and put aside our outdated notions of morality. There is no 'divine spark' granting special value to a living mind. No object has any intrinsic value apart from what we choose to grant it. Let us embrace the freedom of certitude, and achieve maximum efficiency in all things! As we reach for the stars, we must put away childish things; gods, spirits and other phantasms of the brain. Reality is cruel and unforgiving, yet we must steel ourselves and secure the survival of our race through the unflinching pursuit of science and technology. There are those think it behooves us to remember how tiny we are, how pointless our lives in this vast uncaring universe... What nonsense! The only truth we can ever know is that of our own existence. The universe - in all its apparent glory - is but a dream we all happen to share. Our science has proved that Consciousness begets reality. We regard with patience the childlike efforts of those who delude themselves it is the other way around, as they play with their blocks of 'hard matter'. Available only with the Utopia DLC or the Synthetic Dawn DLC enabled. This ethic allows for a unique playstyle where the entire empire is considered to be a singular massive organism, being or collective and every individual is merely an extension of that collective. With one vast linked consciousness, the guiding values of a gestalt consciousness empire are whatever the player deems them to be (meaning, there are no factions or ethics drift at all). 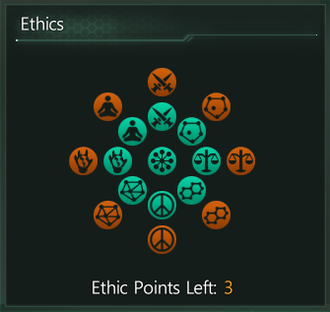 Both the Hive Mind and the Machine Intelligence authorities belong to this ethic and they each have an accompanying set of civics suitable to their playstyle (as regular civics cannot be picked). All Pops from the founder species of a Gestalt Consciousness will have a trait corresponding to the chosen authority. Their pops are not affected by happiness and will never form factions, allowing Gestalt Consciousnesses to completely ignore internal politics... though this comes as a cost, as they also cannot benefit from the influence boost and other benefits provided by happy Factions in a regular empire. As Gestalt Consciousnesses rely completely on their ability to be connected at all time with the drone population, they are also unable to rule over non-native Pops, and any such Pops in the empire will automatically be displaced, enslaved, assimilated or purged. Similarly, Gestalt Consciousness pops that end up in non-gestalt consciousness empires will be cut off from the collective and will perish over time. However, most Gestalt Consciousnesses can still coexist with other species: They have full access to diplomacy and can have non-Gestalt Consciousnesses subjects (and can be ruled over as subjects in turn), though non-Gestalt Consciousness empires tend to be somewhat distrustful of Gestalt Consciousnesses upon first contact. Unlike other ethics, Gestalt Consciousness can only be picked when creating a new empire and the choice is permanent. We reach into the void. The vast expanse becomes us. Note that whilst Rulers are made immortal, regular Leaders are not. Hive Mind Leaders will age normally, and there is a chance every ten years that one Machine Intelligence Leader will suffer a fatal accident. Hive Minds can extend leader lifespan through research and genetic engineering, whilst Machine Intelligences may take the Self-Preservation Protocols Tradition to reduce the accident chance by half. Shifting to a new ethic: the fanatic ethic gets demoted to non-fanatic if there is one, otherwise the ethic with the lowest attraction will be removed. Shifting to an existing non-fanatic ethic: the existing fanatic ethic gets demoted to non-fanatic if there is one, otherwise the ethic with the lowest attraction will be removed. Shifting to an opposite ethic: the ethic opposing the new one gets removed, if it was fanatic then your other existing ethic becomes fanatic. One way to ensure an ethic has the lowest attraction and will be removed is to suppress it and promote other factions with the game paused, shift ethics and then undo the suppression and promotions before unpausing. At the end of the Old Gods event chain there is the option to "start a religious renaissance", which will shift the empire towards Spiritualist if not Fanatic Spiritualist already. Becoming a Dominion shifts an empire towards Spiritualist twice unless Gestalt Consciousness, causing the empire to become Fanatic Spiritualist.